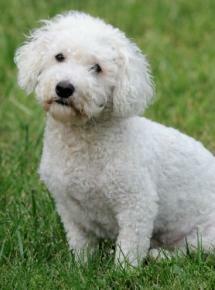 A bichon frise poodle mix is a cross between bichon frise and poodle dogs. It is also called a poochon. The bichon frises are very sweet dogs. They have great temperaments and do well with families. Kids love them and older adults will find them to be great, devoted and loving companions. They always look like they are smiling and are happy dogs. There's just something special about looking at these very cute dogs. They generally have pleasant personalities and are loyal and devoted companions. The bichon is friendly, energetic, gentle and spry. They like to snuggle and cuddle on the couch. Invite them to lay beside you while watching your favorite tv show or reading your favorite book. 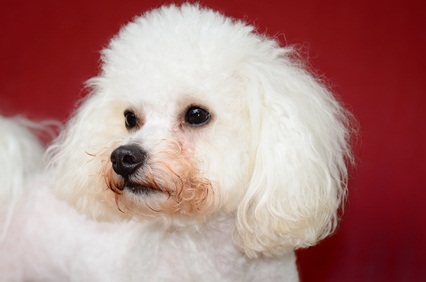 The bichon poodle is highly intelligent, and their coats are hypoallergenic. They may be suitable for families where one or more members have allergies. The poodle parent will either be a toy, standard or miniature. The resulting poochon will vary in size depending on the size of the poodle. Poochons will live up to 15 years and need a moderate amount of daily exercise including walks. Smaller dogs can also be exercised and played with indoors, larger dogs should be walked at least once a day. The color can vary depending on the color of the poodle parent, but usually tends toward the white or lighter side if the parent is a light color. A darker colored poodle parent may result in a darker colored poochon. The poochon is such a cute dog! With their happy dispositions, their loving attitudes and their devotion to their owners, these are great dogs who will be great companions for many years to come.